Lots of photos here, folks! I enjoy the look of the i-cord bind off. If you haven't done it before, I hereby present you with a little tutorial on how to do so. The super-cool thing is, if you know how to do the i-cord bind-off, you also know how to do applied i-cord. It's the exact same procedure, except obviously to do an applied i-cord you need to pick up some stitches, but you apply the i-cord by doing the i-cord bind-off. Pretty nifty, huh? Also, if there's anyone out there who doesn't know plain-Jane i-cord, I have instructions for that too if you scroll down. Click on any image for a larger view. Step 1: Git yourself some knitting. I knit the demo swatch in garter because the i-cord contrasts more against it than it would against stockinette. I-cord is basically a stockinette tube, after all. .Step 2: If you want a tidy corner edge, cast on a couple of extra stitches -- if you skip this step, the bind-off will lend a slight curve to the corner of your knitting, which is fine, if that's what you want. As Elizabeth Zimmermann would say, it's "knitter's choice." Step 3: Knit the first two stitches, then EITHER knit two together OR ssk (slip the next two stitches knitwise, then knit them together from this orientation -- a left-slanting decrease.) I use the ssk decrease because it's my personal preference. Try both and use what you prefer, there's not much difference in the final product. Step 4: See the three stitches on your right-hand needle? Slip them all back over to the left-hand needle. 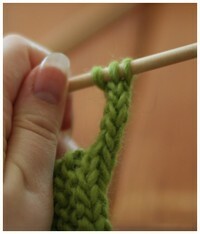 Step 6: ...and your bind-off will start to look like this. See? it's a three-stitch tube of stockinette across the top of the work. I guess step 6 isn't really much of a step, but I do think it's nice to take a second and admire your own work. Step 7: Ah-ha! You have reached the end, there are three stitches left. What do you do? If you are done binding off, cut your yarn leaving a tail at least six inches long, thread it on a tapestry needle, weave through the remaining three stitches, pull tight, and weave in your end. Or, if you want to continue, you can do so, and that would be just a plain old i-cord. Not acquainted with friendly Mr. I-cord? Read on. I-Cord Step 1: You've got those three stitches, right? Well, it doesn't actually have to be three stitches, but if you're going to make an i-cord, it should be a small enough number of stitches that you can pull the yarn tightly across the back to get it to curl into a tube, 3 or 4 will work. 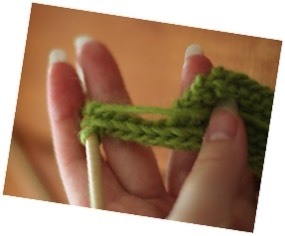 When knitting an i-cord, use either two DPNs or a circular needle so that you can just slide your stitches over instead of dealing with the whole slipping-back-to-the-left-hand-needle business. Anyway, the yarn is coming out of the back of that third stitch on the needle -- just pull it across the back of the work so you can knit. You always knit in i-cord, you never purl because you never turn your work. Step 2: slide your stitches down to the other end of the needle so you can knit them again. Keep doing this for years and years until you have the length you want, tugging the end of the i-cord occasionally to help evenly distribute the yarn carried across the back. You can see that the i-cord is, indeed, a wee tube. It's a pretty handy tube, because you can "weave in" your ends by just running your tapestry needle through it. You can also kind of see the back of the i-cord bind-off in this photo, which as you can see looks pretty much the same on both sides. Neat-o.